I Won, Now It's Your Turn: Mother's Day Giveaway - Are You Finished Yet? This post is all about winning. Winning for you, and winning for me…well, technically not me. For one of the dresses you so kindly helped me choose to wear to next week’s Listen to Your Mother performance. But first, let’s talk about the winning for YOU, because the dress is pretty good at being patient and can wait. Mother’s Day is around the corner. And just like good mamas take care of their young, what better excuse is there for me to take care of my readers? I have teamed up with my friend Maggie, owner of Jewelry Made by Maggie, who designs and creates some of my favorite pieces in my jewelry box. You want understated, timeless pieces you can wear everyday? She’s got those. Want colorful, trendy statement pieces for a night on the town? She has those, too. I haven’t seen one thing in Maggie’s Etsy store that I don’t love, and my husband is thankful to have a default go-to when gift-giving occasions roll around. You know, gift-giving occasions like Mother’s Day. Because she is totally awesome, Maggie agreed to help me treat one of my mama readers…or even a reader who just has a mama. 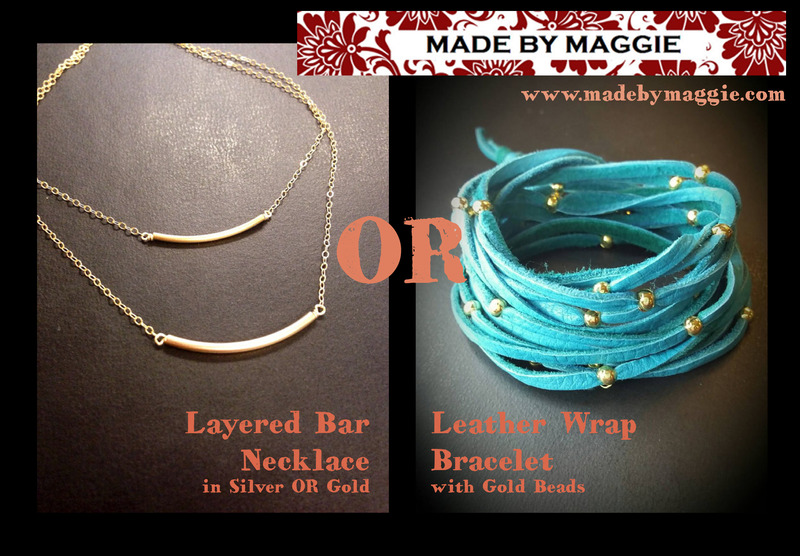 Everyone who enters our giveaway gets a chance to win EITHER a Layered Bar Necklace (in silver or gold – valued at $34) OR a Leather Wrap Bracelet with Gold Beads (valued at $30) from Maggie’s Etsy store. Your choice! All you need to do is visit our GIVEAWAY PAGE here. There are several different options for earning entries, and you can do as many or as few as you want. The first is to sign up to receive my newsletter, Weekly Mayhem. It’s an easy way to get blog posts plus other awesome bonus stuff delivered straight to your inbox…and I promise it will only come out once a week AT MOST. No spam, or even canned ham. And my newsletter subscribers have been known to get a little special treatment every now and again. In addition, Maggie would love you to follow her on Instagram or Facebook, where she often offers deals and sales on her pieces. For BONUS entries on top of the ones on the Giveaway Page, you can do one of two things: 1. Reblog this post and leave a comment letting me know you did OR 2. Head to my Facebook page and share the giveaway post from there. (But make sure you go to the Giveaway Page first…that’s the only way to officially enter.) The giveaway will close the evening of Saturday, May 9th. I will announce the winner on Mother’s Day, May 10th, at which time the winner can choose which prize she (or he) wants. Then enjoy your little gift to yourself, or give it to a mother you love. Now, back to the dress. In my last blog post, I asked you all to help me choose between 4 dresses for my performance at the St. Louis Listen to Your Mother Show. 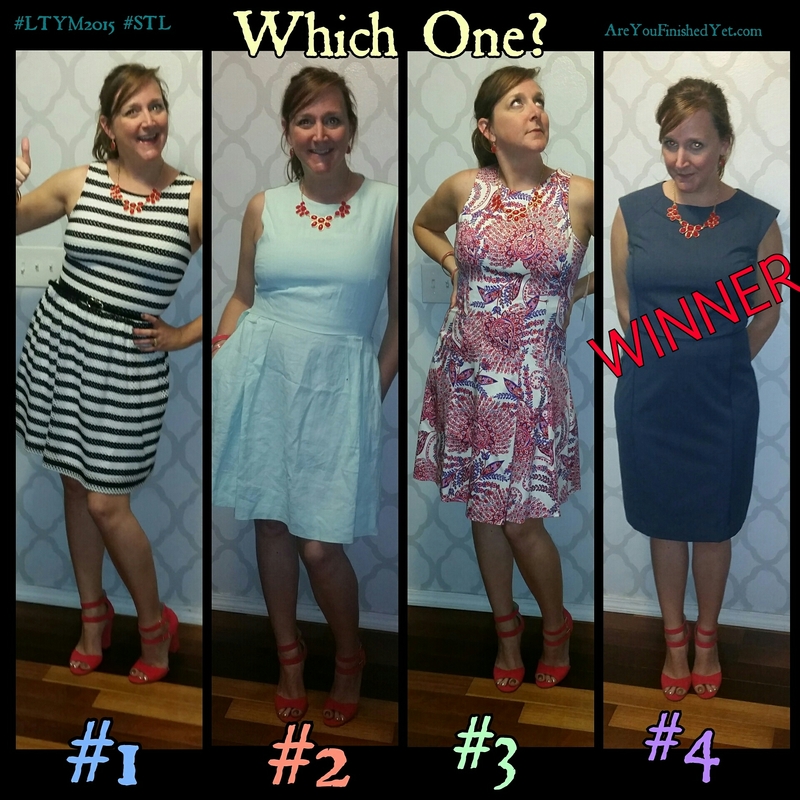 From all the comments I received here and on social media, the two top contenders were dress #3 (the red floral) and dress #4 (the navy one). From those two, I went with my gut and chose…DRESS #4!! I love the way I feel in it, and how it really let my fabulous shoes shine. It got extra points for being a piece that will stay relevant in my closet for a very long time. I know some of you fiercely loved dress #3, and it was adorable. But fear not, I may have found it a good home with someone else, and it won’t have to feel the sting of making the walk of shame back to the returns counter. I also took the sage advice of some of you and kept a bonus dress, just for myself. I fell in love with dress #2 from the moment I put it on, and I plan on getting hella wear out of it (starting on Mother’s Day) with heels, flats, or sandals. I mean, it has POCKETS. How could I pass that up? Thank you so much for putting in your two cents. I loved reading everyone’s opinion, and I may have you vote on stuff more often! With that said, I would love to see some friendly faces in the audience at the LTYM show. If you’re in St. Louis, come out on May 9th and see the winning dress in person! You can get your tickets here. Please Be My Fashion Police | Are You Finished Yet? Thanks! Those dang letter limits get me every time! Those are nice pieces, but my wife really wanted a new lawnmower this year.